Quick check in: wrote some more on Story Blue today. It sits at just under 3000 words- which is nothing spectacular but definitely a good start. It’s going to be a challenging week coming up to stick to my 30 Days of Write challenge- I’ll be out of town for work most of the week. I’m making my list of everything I need to keep writing while traveling. Wish me luck and stay tuned! So- May has not been a very productive month. I’ve only posted a handful of times- although I am really proud of a couple of them. (Did you read this one? I’m really happy with it.) It has just been a challenging month- mainly due to my day job. Finding the energy to write has been tough and as my relatively few postings show, most of the time I simply blew it off. But- clearly I’ve tapped into my creative parts in this process and they are not interested in being shut away again for 20 years. I’ve been on edge and unsettled for most of the month. I’d be willing to bet that my wife would have voted me off the island this month if that was possible. The most content I’ve been all month has been when I was actively writing something or just after I’ve posted a new piece. Having started this process of self-transformation, I think that I now need this creative outlet on a regular basis- hence the post’s title. A Peek at Story Blue! Hi- still writing here and wanted to check in. 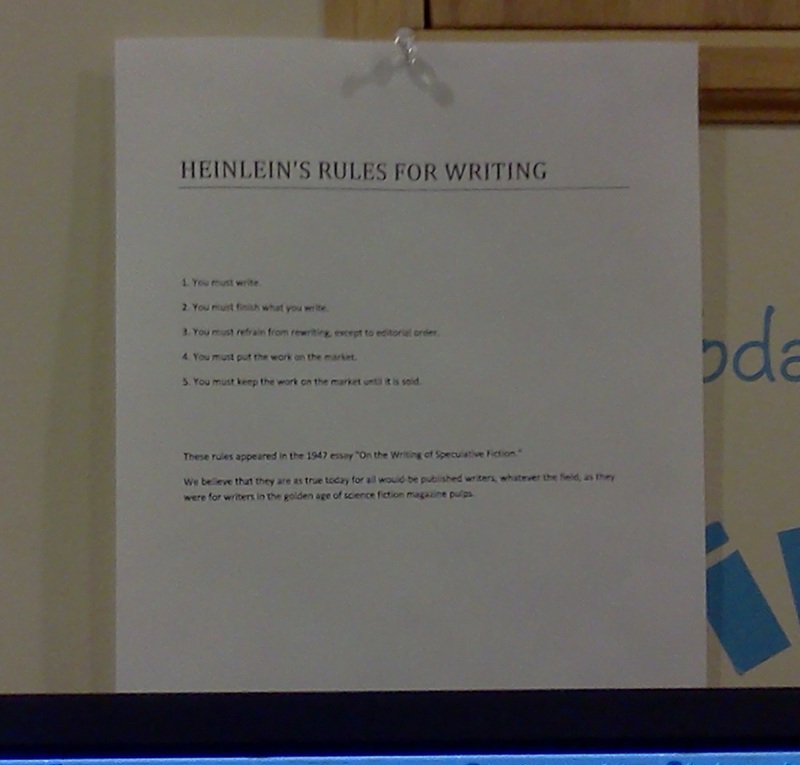 These rules are posted just over the top of my monitor and they truly provide direction for me. Sharing them got me thinking about Story Blue again. I started it in the middle of February and have more than 2400 words of story with another 600 or so words worth of notes for the story. Although a previous post discussed my thoughts on needing to develop the story’s main character more, apparently the story had enough time simmering in my unconscious mind to be ready for some more attention this morning. I woke up early and before 9 AM had added a few hundred more words (and a better visualization in my mind of the protagonist). So in the spirit of Heinlein’s 4th rule, I posted the opening of Story Blue this morning. (Heinlein says to put the work on the market. I don’t know if I’m at a point to try to sell anything but I think posting on the blog is consistent with his direction.) Currently titled “The Third String”, it’s just a few hundred words but I think representative of the story. Please read, share, and comment. Thanks!